"We now have an amazing library which the children love. There are places for the children to hide and read. We can help the children to read but learning to love reading is more difficult. This library definitely helps. All our children look forward to their library slot every week." 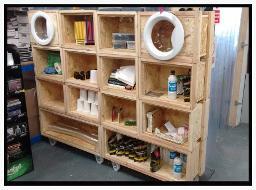 "UPcycling Project has worked on a number of projects with ReCreate including the interior design of the Warehouse of Wonders and at all times I have found them inventive, creative and a pleasure to work with. I have no doubt they would bring an extra dimension to any initiative with theirs project management , innovative and practical skill base." 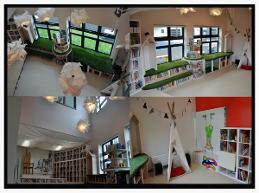 "We're delighted with the sensory room, the children love it, especially the grass topped areas. They aren't yet using it in the way I had envisaged ... as a place to relax and calm down, it's still a very exciting space for them and they spend a lot of time jumping on and off the crates, rolling around on the grass and running along the top, down the step and to the bubble tube and back again- then jumping off the high part! They are particularly fond of the 'stairs' which was a surprise to me. One or two enjoy the dark tunnel space. They enjoy the different surfaces, especially the soft surface inside the crate which has the houses in it. The adults love the space and all love to go in there and sit on a bean bag and enjoy the star projector! "